One of the reasons I moved to Florida close to 20 years ago is I love spending time outdoors (and I was tired of the snow!). Although I spend a lot of time inside working, I still love getting outside as much as I can. That goes for my pets, too. They love running around at the dog park or even just playing in the backyard chasing squirrels or tennis balls. Each month, I make sure that they receive their monthly heartworm prevention chew to ensure that they are protected against a disease that is more common than one might think. 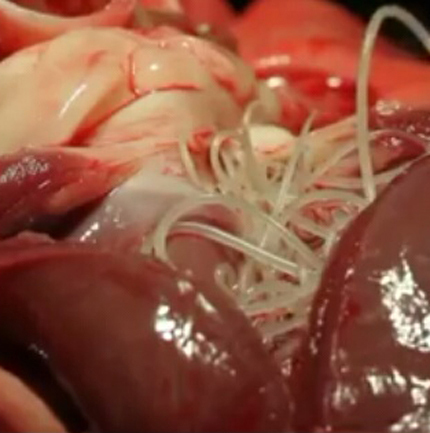 Heartworm Disease infects more than a quarter million pets each year around the United States. According to the Companion Animal Parasite Council, more than 1200 pets tested positive for heartworms in Hillsborough, Pinellas and Pasco Counties in 2017. (Visit www.capcvet.org/maps to see maps broken down by your county) The actual number of infected pets is certainly higher, as not all pets are tested each year, and unfortunately not all pets are on prevention. How does a pet become infected? Mosquitoes spread heartworm disease, but not all mosquitoes. A mosquito must first bite an animal that is already infected with the disease. At that time, the mosquito can spread the disease to other pets- most commonly dogs. Cats can get heartworms, too and I’ll cover that in another article. Early signs of heartworm disease a dog owner might notice include listlessness and weakness, shortness of breath, a quiet, dry cough and what you could interpret as nervousness. When I examine a dog for heartworm, I listen for abnormal sounds in the heart and lungs. In severe cases, I often detect stomach and leg swelling, which are signs of congestive heart failure. If your dog isn’t on a regular schedule of preventative heartworm medication and you notice any of these signs, you need to make an appointment with your veterinarian right away. The best way to prevent heartworm disease is to ensure that your pet receives their prevention on a regular schedule. I give my dogs their prevention on the same day of each month. To make sure I don’t forget, I put it on my calendar on my phone and set it to alert me each month on the same day. 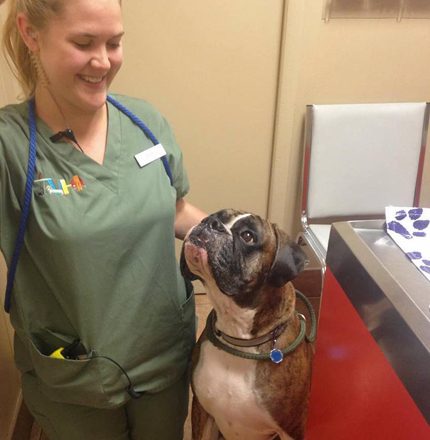 Tampa Veterinary Hospital also offers ProHeart, which is an injectable prevention which lasts for 6 months. If you struggle to remember giving your pet their oral prevention product, ProHeart may be a good option for you and your pet. It is also a good idea to eliminate areas around your home where mosquitoes can breed. Standing water is a mosquito breeding ground, so check around your patio or yard to ensure there are no spots where the pests can reproduce. What products do you recommend, and when? We have several heartworm prevention products we can recommend for your pet. Some also contain prevention for other types of worms, some are packaged with flea and tick prevention. Each pet may have different needs based on their lifestyle. Ask your veterinarian which is best for your pet. If your pet has never been on heartworm prevention, it is important to have a heartworm test performed before starting any prevention product. Giving heartworm prevention to a pet who has heartworms can have severe adverse affects. That’s why we recommend a heartworm test every year to ensure your pet is heartworm free. It’s always mosquito season in Florida, even in the winter months. So ensure that your pets are given their heartworm prevention each month.